Highmark's new advertising campaign running on one of Lamar Advertising's bus shelters in Pittsburgh. 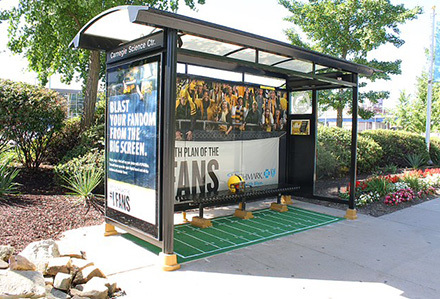 Lamar Advertising Company's bus shelters have a key role in a Highmark marketing push. The downtown Pittsburgh-based health insurer on Thursday unveiled a North Side bus shelter that has been decked out for the football season. The shelter is located between Heinz Field and Carnegie Science Center and here’s the twist: pictures taken at the shelter may appear on a big digital billboard nearby on Reedsdale Street. “This integrated consumer experience is a small way to show Highmark’s commitment to the community and the amazing fans who live here,” Marketing Vice President Tony Ryzinski said in a prepared statement. 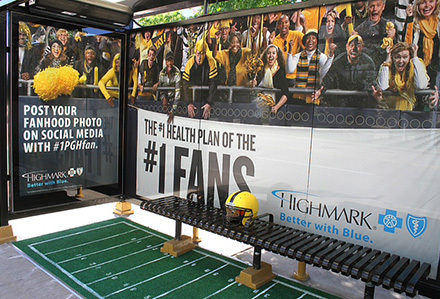 One of Lamar Advertising's bus shelters in Pittsburgh was transformed into a football stadium for Highmark's campaign. Fans who take photos inside the shelter and upload to social media will have a chance to be featured on Lamar's digital billboard outside the stadium. The cost of the campaign was not released. Also part of the campaign will be a Highmark banner for a light rail car, which serves North Side and will ready for Sunday’s Steelers game at Heinz Field. During a cold snap last winter, Highmark used warming stations at bus shelters to promote Community Blue, a low-cost limited network health insurance plan. The warmers were installed at four locations downtown as the mercury plunged below zero. Companies love to place certain things on a pedestal for all to see. 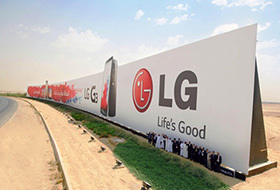 LG went down a decidedly non-traditional route by announcing that it set a world record for “the largest outdoor advertising structure.” A billboard advertising the LG G3, is 240 meters wide and 12 meters high. In total, we’re looking at 3,000 square meters of pure G3 advertisement bliss. 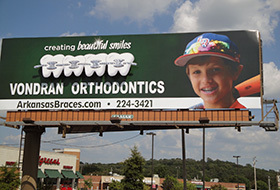 Lamar Advertising Company and Vondran Orthodontics are responsible for bringing the first 3D billboard to life in West Little Rock, Arkansas. The innovative billboard design features a row of 3D teeth and braces with reflectors to increase visibility during the day. At night, LED lights positioned behind the teeth glow, making the billboard fully visible at all times.